The bathroom is one place where you can de-stress after a long tiring day. Having an aesthetic, warm ambiance in your bathroom boosts the relaxation you get while bathing and gives the interior that wow factor. 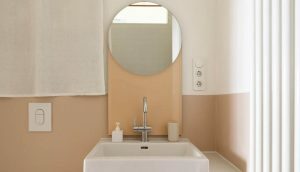 If we frequently change the interiors of our living room, kitchen and bedroom, why shouldn’t we conduct more bathroom renovations? With the interior design industry booming and new designs coming up each passing day, the variety of absolutely stunning bathroom renovation options available out there is insane. 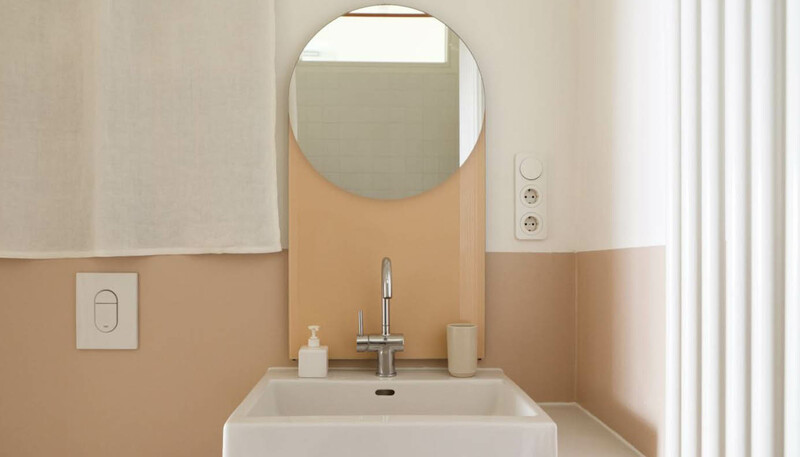 There’s a lot to choose from, though there’s one question that keeps bugging- what are some of the best renovation ideas that make anyone who steps into your bathroom go bonkers? Curve-oriented bathroom renovation is and always will be an elegant, classy and absolutely beautiful bathroom renovation choice. You don’t have to add curves to the entire bathroom, which will get fussy and ruin the overall look. 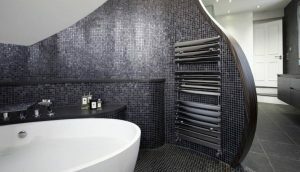 Get one wall of your bathroom curved to maintain the flexure; like a curved shower wall for instance! Choose equipment and faucets in a shape that compliments your curvy renovation theme. Voila! You have a really elegant eye-catching bathroom look. One of the hottest renovation choices around today, floating vanity is perfect for washrooms of any size and shape. They’re hip, contemporary and exhibit spaciousness. 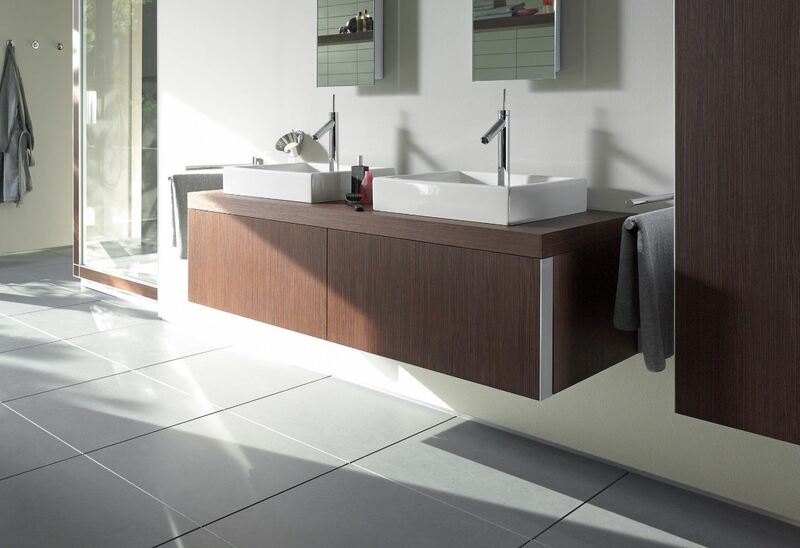 Build your bathroom’s main cabinet to look as if it’s floating. It avoids unnecessary fullness and also gives your bathroom a sense of authenticity. A great example of this is one we have found over on Decoist. People usually prefer white or carpeted bathroom floorings to make the tub, skin, and cabinets contrast nicely with its surface. 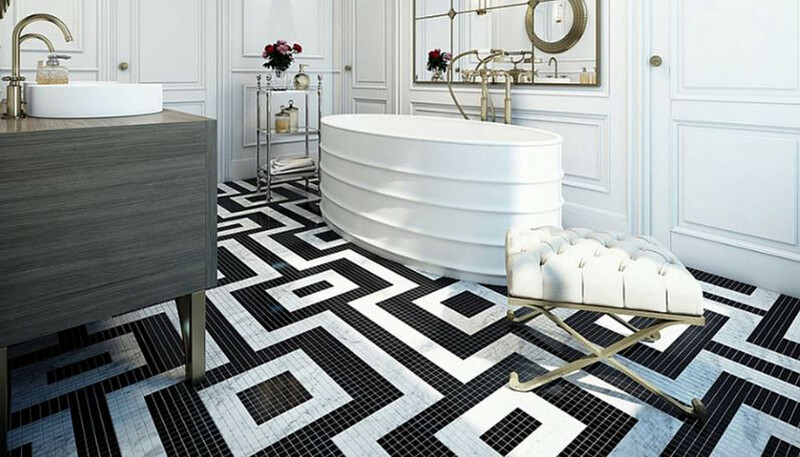 Did you know that upbeat and bold flooring would do the same job while also transforming the look of your personal little spa into something completely out of this world? Bold, graphic floorings are gaining insane popularity, new designs hitting the market quick and more people preferring this off-beat bathroom look. Just like this floor tile design from Victorian Plumbing, we just cant take our eyes of it! If you think graphic flooring would be a little too much for your taste, you can always go for a large printed rug that complements your bathroom’s look. Bathing in the company of nature is more than soothing- it’s a therapy in its own unique way. More and more people are preferring this indoor-outdoor look to experience that feeling. 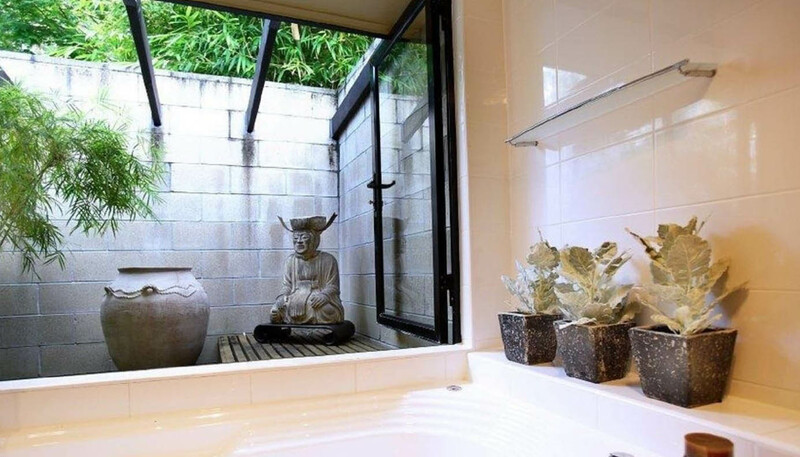 If you’ve always fancied an open, natural bathroom look, this is the one for you. You don’t even have to fret over privacy as glasses used in this theme are electric privacy glasses. These switch instantly from crystal clear to frosty opaque in the blink of an eye, controlled by a switch. Country living isn’t complete without having the experience of bathing in an indoor-outdoor bathroom. 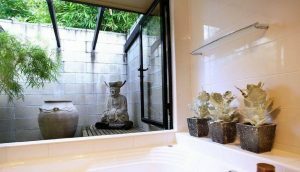 You can pull off this bathroom look by adding large wall glass right before your bathtub, you can also go for a smaller window. If this look is too uncomfortable for your taste, you can choose from wide selection of built-in skylights that make you feel you’re bathing under a starry beautiful sky.